Danish designer Hans Hornemann took inspiration for the Ace series from his own life in Copenhagen. The series aims at urban dwellers, who prioritize quality and aesthetics but who must also adapt to the limited space of life in the city. With a recurring design trait of friendly, organic lines, Ace offers maximum comfort in condensed form. The design balances finely between the refined and the relaxed. Rounded contours emphasize the inviting volume of the full upholstery and are framed elegantly by the piping around the seat and back. A backward-leaning backrest and cheekily angled legs give edge and attitude, resulting in a design of timeless and nonchalant elegance. The back is constructed of molded PU foam on a base of molded veneer for flexibility and the highest possible sitting comfort. 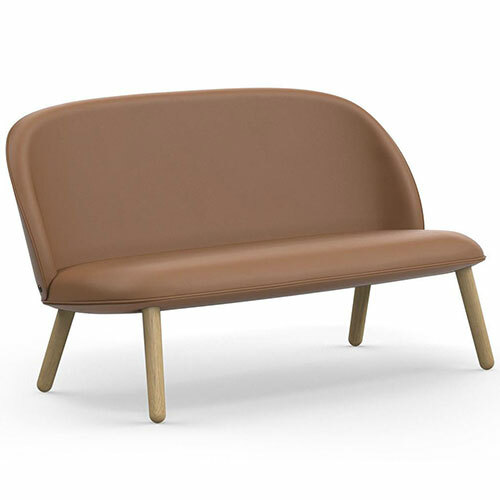 The seat is made in molded PU foam with steel reinforcement. The legs are coned steel tube which makes the chair appear more elegant. On top, there is a welded flange to improve stability. Textile or leather upholstery. The collection includes: lounge chair, sofa, and dining chair. Handmade in Lithuania. Designed in 2016. Awards: Germany Design Award 2017 and If Design Award 2017.